It has been awhile since I’ve talked technology on the blog despite a fair number of changes in this fast paced world. I would like to do a technology feature each month and so I will keep my focus narrow on this post. 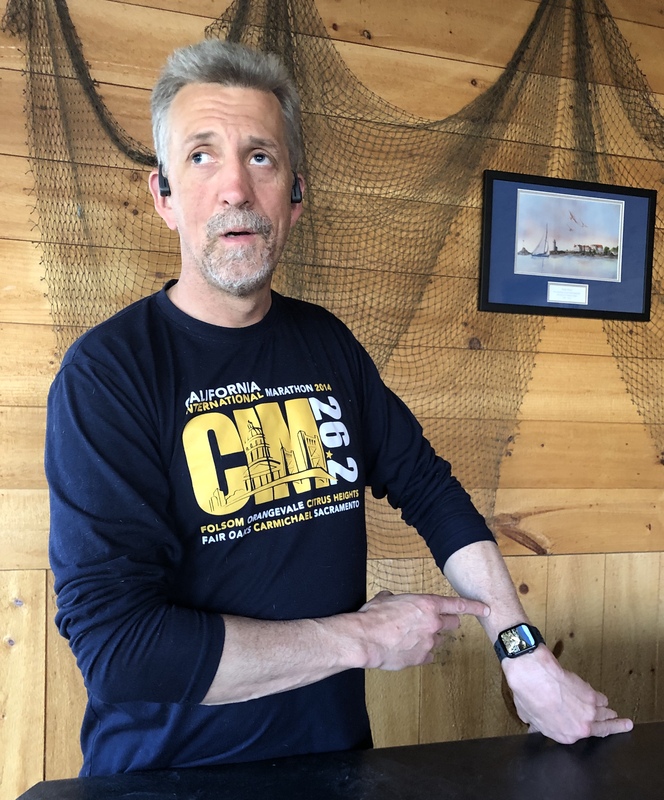 As the Boston Marathon approaches on April 15, one of the workout tools I use commonly is my Apple Watch. Initially it provided me an accessible means to track the distance and pace of my runs independently. While no other running watch managed accessibility for the blind so capably, the robust additional features of the watch quickly became integrated into my presentation approach, my efficiency, and overall life comfort. Yet as my original watch aged, I began evaluating how many of the new features and benefits of the most recent watch would be worth my upgrading, how deleterious the slowing and outdated aspects of my older technology hindered me, and how much I was simply giving in to the technology lover within me. Ultimately, all of those factors and a little budget planning brought the Series 4 GPS/Cellular Apple Watch to my wrist. “Voice Over” is the Apple accessibility program for their computers, iPhones, and watches. A voice speaks aloud the key information on the screen and provides a generally simple system for a user to interact with the device differently from a sighted user. I’ve created a very basic demonstration video for both my watch and phone. With few exceptions I have access to all the applications and features of these devices and the power these bring to my every day world is tremendous. As such, I wanted to share my top six reasons why I enjoy this new technology. There are many forms of these devices and I use a water resistant version for running, travel and meetings. These transfer sound through bone conductivity rather than through the air and thus our ears are free to hear the ambient noise around us. This means I can hear conversations, traffic other technologies while using my phone or watch. This has become even more beneficial with the cellular connectivity of my Apple Watch Series 4 since it means I can take calls seamlessly without my iPhone. In June, this technology will be integrated into a pair of sunglasses to further increase my comfort. It Simply Works. My watch had previously begun to frustrate me more often than I preferred as it took multiple taps and presses to accomplish tasks. The processing power was too far behind the watch operating system to manage Voice Over and all my tasks efficiently and the result was multiple failures. Now a single attempt is seemingly always successful and the speed and efficiency feels effortless. Fall Detection. My favorite feature I hope to never need. As many know, my 2016 year was challenged by frequent episodes of losing consciousness. This had me home-bound for Autumn and my safety unless we could travel with others. Medication has helped me manage my rare condition very well and I haven’t had an episode since that time, but the watch has a feature which enables it to detect if I should fall. If this happens and I don’t move for 60 seconds after the fall, it will ask me to acknowledge I am ok. If I do not, it will text an alert with my location to my emergency designated contact and it can call 911 and alert them similarly with my location as well as heart information the watch will record for me. I hope to never use this but it is some comfort to know it is there. Running Benefits. I am after all a runner and this was the initial impetus for the watch. I can fully customize what information is important to me and have that readily spoken to me throughout my workout. Rolling pace, heart rate, and distance are all valuable information that’s easily accessible during my run. The extensive full suite of data points for after the run includes elevation, splits and cadence which all back up to my phone and iCloud upon my return home. Add in the ability to bicycle, swim, yoga, cross-train and a host of other workouts as well, and this has become a tremendous exercise companion. Haptic Feedback. During my presentations I can preset alarms and timers to gently tap my wrist at specific points to alert me. This helps me ensure my presentations are progressing at the right pace and I’m keeping on target to cover all the material within the time limits imposed by any of the various opportunities. This seamless integration into my presentations has been a tremendous support to improving the quality of a fundamental part of the 2020 Vision Quest mission. Convenience. I never needed a cell phone until I had one and then I began to appreciate how often I could benefit from it. Some might be tempted to use the word “depend” for this relationship. Similarly as I’ve come to use my watch I have found so many convenient aspects which I prefer to have in my life. All the quick informational discoveries of a text or notification are at my wrist with a “virtual glance” rather than going to my phone or computer. Similarly while working at my computer I can manage a side task from my watch with ease and barely disrupt the focus on my primary project. I would happily take a deeper dive into the many positive aspects of my watch and technology, but that will have to await another blog and your requests for more technology tidbits!